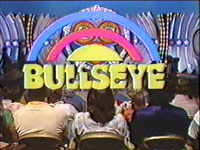 Bullseye is an American game show that aired in syndication from September 29, 1980 to September 24, 1982. Jim Lange was the host, and the program was produced by Jack Barry and Dan Enright. Jay Stewart was the announcer for the first season, and Charlie O'Donnell announced for the second season. The series' executive producer was Ron Greenberg. This webpage uses material from the Wikipedia article "Bullseye_%28U.S._game_show%29" and is licensed under the GNU Free Documentation License. Reality TV World is not responsible for any errors or omissions the Wikipedia article may contain.